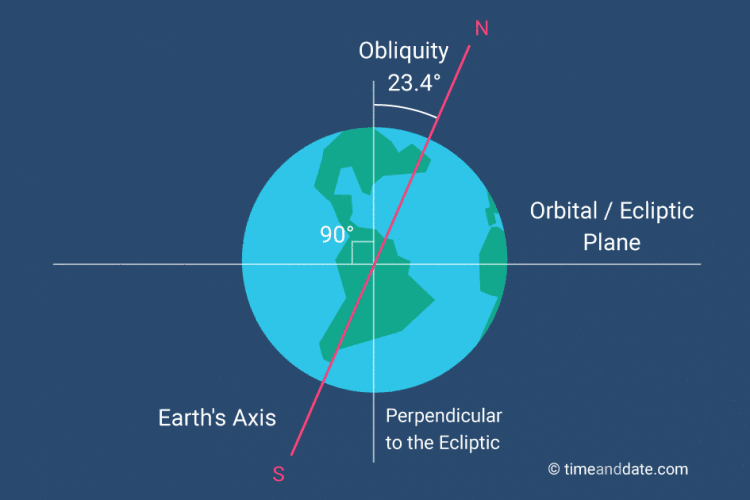 Home » » What Is Earth's Axial Tilt or Obliquity? In astronomy, an axis refers to the imaginary line that an object, usually a planet, rotates around. Earth's rotational axis is an imaginary straight line that runs through the North and South Pole. In our illustrations, Earth's axis is drawn as a straight red line. When an object the size of Mars crashed into the newly formed planet Earth around 4.5 billion years ago, it knocked our planet over and left it tilted at an angle. The impact, around 4.5 billion years ago, is described in the Giant Impact Hypothesis, which is the current prevailing theory on how the Moon was formed and how Earth got its tilt. Ever since this impact, Earth has been orbiting the Sun at a slant. This slant is the axial tilt, also called obliquity. Earth's obliquity angle is measured from the imaginary line that runs perpendicular to another imaginary line; Earth's ecliptic plane or orbital plane (see illustration). At the moment, Earth's obliquity is about 23.4 degrees and decreasing. We say 'at the moment' because the obliquity changes over time, although very, very slowly. Today, on 10 January 2019 at noon, Earth's axial tilt, or mean obliquity was 23.43680° or 23°26'12.5". Earth's mean obliquity today is about 0.00001°, or 0.04", less than 30 days ago. The Arctic and Antarctic circles today are 1.2 m (4 ft) closer to the poles, and the Tropic of Cancer and Tropic of Capricorn are equally close to the equator than 30 days ago. Earth's axial tilt actually oscillates between 22.1 and 24.5 degrees. The reason for this changing obliquity angle is that Earth's axis also wobbles around itself. This wobble motion is called axial precession, also known as the precession of the equinoxes. It is caused by the gravitational force from the Sun, the Moon, and other planets. Axial precession can be described as a slow gyration of Earth's axis about another line intersecting it. A complete wobble of Earth's axis takes around 26,000 years. It outlines the shape of a pair of cones or two spinning tops connected at the tips, which would be at the centre of Earth. Because Earth orbits the Sun at an angle, the solar energy reaching different parts of our planet is not constant but varies during the course of a year. This is the reason we have different seasons and why the seasons are opposite in the Northern and Southern Hemispheres.